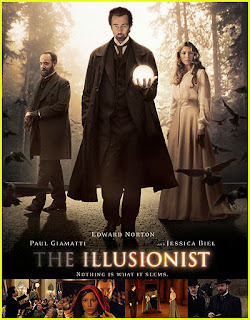 The film begins in medias res as Chief Inspector Uhl (Giamatti) recounts the history of Eisenheim for Crown Prince Leopold, following Uhl's visit to the theatre to arrest Eisenheim during what appears to be necromancy passed off as a magic show. Eisenheim was born the son of a cabinetmaker in Austria-Hungary. One day when he was a teenager, Eisenheim (played as young man by Aaron Johnson) meets a traveling magician along a road. The magician performs several tricks for him and then, according to various accounts, both the magician and the tree he was sitting under vanish. Eisenheim becomes obsessed with magic tricks after this. meet in a secret hideout chamber in the woods, where Eisenheim tells of his plans to go to China to learn more magic and Sophie promises to go with him. On the day that they are going to leave, however, the police come looking for Sophie. The two hide in the secret room and Sophie begs Eisenheim to make them both disappear. He is unable to fulfill this request and the two are separated. Eisenheim leaves his village to travel the world; he perfects his magic and returns 15 years later as a master illusionist. He meets Sophie at one of his performances, when she is volunteered by the ruthless Crown Prince Leopold as a reluctant participant in a trick. He soon learns that Sophie is expected to marry the Crown Prince, who purportedly has a history of abuse towards women. Eisenheim and Sophie, having recognized each other, meet privately, whereupon it is revealed that Sophie still has the locket he made for her years ago. After humiliating the Crown Prince during a private show, Eisenheim finds his hit performance shut out of Vienna. When Sophie comes to offer him help, the two at first fight, but Eisenheim soon kisses her, leading to the consummation of their relationship and the realization that they are still in love after all this time. They plan to flee the Empire together; but first, Sophie points out, something must be done to stop Leopold, who, she reveals, is planning a coup d'etat to usurp the Crown of Austria from his aging father, the Emperor Franz Joseph I, while using his engagement to her to win the Hungarian half of the Empire as well. She also knows that the Crown Prince will view her as disposable if she leaves him for another man, and that he will have both her and Eisenheim followed and killed in order to protect his ego. him unthinkable, despite an existing belief among the people that Leopold has murdered a woman in the past. As Eisenheim plunges into despair and the citizens of Vienna begin to suspect Leopold of Sophie's murder, Uhl observes Eisenheim's actions more closely on behalf of Leopold. Wracked with grief, Eisenheim prepares a new kind of magic show, using mysterious equipment and Chinese stagehands. Eisenheim purchases a run-down theater and opens a new performance. During his show, Eisenheim apparently summons spirits, leading many to believe that he possesses supernatural powers. Leopold decides to attend one of Eisenheim's shows in disguise. During this show, Eisenheim summons the spirit of Sophie who says someone in the theater murdered her, panicking Leopold. Uhl pleads with Eisenheim to stop, but Eisenheim refuses. Finally, Leopold orders Eisenheim's arrest, but when Uhl tries to arrest him during a live show, Eisenheim's body fades and disappears. Inspector Uhl first searches for Eisenheim at his house. There he finds a folio labeled "Orange Tree," the name of one of Eisenheim's illusions which had intrigued Uhl. Thinking he will find the solution to one of the magician's most famous tricks, he opens it to find empty pages except for a scrap of parchment showing how to open the locket Eisenheim had given Sophie when they were young. At this point, we return to the first scene of the movie. Uhl reveals to Leopold that he has found evidence which links the Crown Prince to Sophie's murder: a jewel from the prince's sword and Sophie's locket that Eisenheim gave her when they were children. After ordering, then begging Uhl to keep silent, Leopold discovers that Uhl has already informed the Emperor and the General Staff of Leopold's conspiracy to usurp the Austro-Hungarian throne. As the Army arrives at his Palace to arrest him, Leopold shoots himself in despair after angrily denouncing democracy, saying that there were "too many voices clamoring to be heard", and that nothing would get done. In the next scene, Uhl is shown leaving the Imperial Palace. After he takes a few steps, a boy runs up to hand him a folio labeled "Orange Tree." This time, the "Orange Tree" folio is filled with plans detailing a geared mechanism to make the tree "grow". Uhl demands to know where the child obtained the folio; the child reveals that Eisenheim had given it to him. Uhl spots Eisenheim wearing a disguise and follows him to the train station. After the chase, a montage shows Uhl piecing together how Eisenheim faked Sophie's death and framed the Crown Prince. And while one may think that Uhl would be enraged at Eisenheim, he is actually very much amused. Meanwhile, Eisenheim is seen walking up to a house in the country where Sophie is waiting for him.